Instead of eating all of the ice cream in sight, you could try one of these super cute ice cream crafts with your kids! Whether you're a chocolate lover or an old-fashioned vanilla fan, you will love all of these ice cream crafts. Plus, these cute projects are kid-friendly and don't take too long to complete. 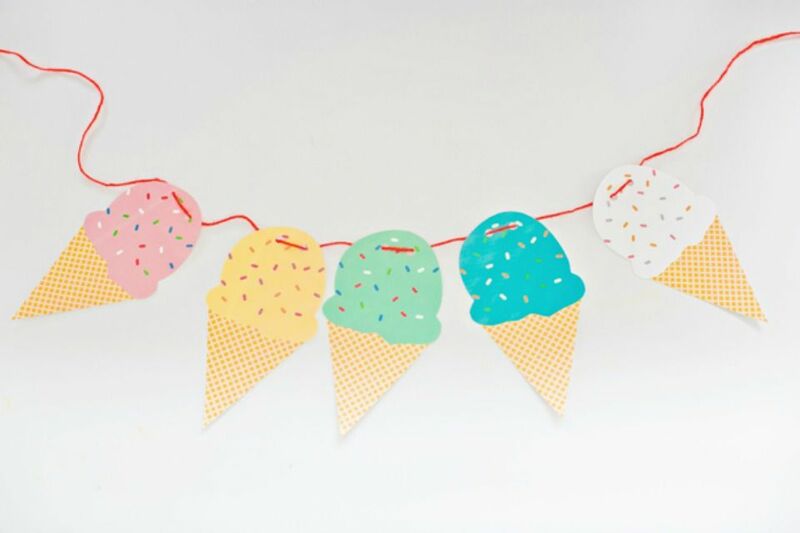 Paper plates, card stock, and pom-poms are about all you need to start this ice cream cone craft. Not only is this project adorable, it's GIANT. What is better than a giant ice cream cone? This origami craft is super easy to fold, making it perfect for kids. Introduce them to the art of origami, and when they've finished, your kids can get creative with decorations, like how this crafter added gems to her origami ice cream cone. What's your favorite ice cream flavor? If it's mint chip then you should definitely try this puffy paint ice cream craft from Crafty Morning. It's easy and lots of fun to do. Use a couple of those old CDs that are lying around your home to make this adorable ice cream craft for kids. Cover the CDs with tissue paper and some glitter to make different flavors and colors. Your little ones can test their senses with this fun ice cream activity from Make and Takes. Fun and YUMMY! Print out this completely free ice cream printable from hello, Wonderful. Punch holes in the ice cream cones and thread yarn through them to make an amazing garland. This is perfect for party decor! Help your kids practice their math skills this summer with an educational and fun ice cream math activity. FUN-A-DAY has the details. Find different colored cupcake liners to be used for this ice cream craft from Glued To My Crafts Blog. SUPER easy for kids of all ages! I love the creativity of this ice cream cone craft. In The Playroom shows us how to turn old egg cartons into pretty and colorful ice cream cones.